Shree Swami Samarth of Akkalkot gave several people His Paduka (foot print or wooden sandals). People used to bring Him wooden sandals. He would bless them and give them back as an object of worship. However, before He left the body in the year 1878, He removed from His neck the one-eyed Rudraksha bead He was wearing and tied it on the neck of His disciple, Balappa. Swamiji put the orange cloth He used around Balappa and also gave Him the flag and Paduka which He was wearing. He gave the following command to Ballapa, “You start a separate Math here”, meaning in Akkalkot. The Math was built and it came to be known as Balappa Math. A new tradition of Gurus thus came into existence – Lord Dattatreya, who is the Guru of all Gurus, then Swami Samarth and then Balappa Maharaj. When Balappa Maharaj was about to leave the body He handed over all the insignia of the Math which He had received from Swami Samarth to Gangadhar Maharaj. He put the one-eyed Rudraksha bead around Gangadhar Maharaj’s neck and handed over the Paduka and the flag as Swami Samarth did before. When Gangadhar Maharaj was about to leave the body He did the same thing to Gajanan Maharaj who was the next choice to occupy the position as head of the Math. Shree Gajanan Maharaj was born on 17th May, 1918 at 00.42 hours at Kharagpur, West Bengal. His mother, Sonamata, was a Yogini. (Yogini is feminine of Yogi.) his father Shivanand Swami was a great Nada Brahma Yogi. His grandfather Tatyaji Maharaj was also a great Yogi. He had innate knowledge of Ayurveda. Thus the preparation was made for several generations of Yogis, for the Son of Man to be born in their family. Rajimwale family comes from Raipur, capital of Chhattisgarh state in India. Shirdi Sai Baba visited the family house of Shree Gajanan Maharaj at Raipur in Chhattisgarh state to bless the place. Shree Upasani Maharaj was the foremost disciple of Shirdi Sai Baba. 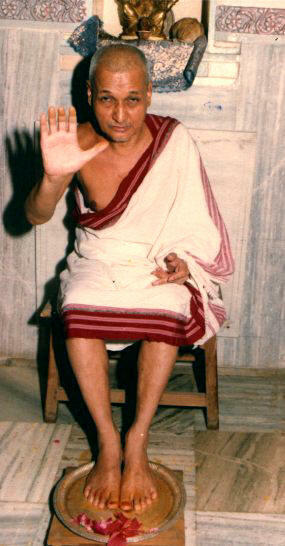 Shirdi Sai Baba commanded Shree Upasani Maharaj to go and stay in the Harijan colony at Kharagpur, West Bengal. This colony is close to the railway quarters where Shree Gajanan was born. His mother, Sonamata, started a revolution when she began visiting this colony and personally serving the lepers in the area. There she met her Guru, Upasani Maharaj, who was sent by Shirdi Sai Baba. Shirdi Sai Baba, with His knowledge of past, present and future, knew that a great Avatar (Divine Incarnation) was to be born there and that is why He sent Upasani Maharaj to that place. In 1921, Laxamanrao alias Shree Shivananda Maharaja and Sonamata along with Shree Gajanan Maharaj was brought to Upasni Baba at Sakori. In 1926 Shree Gajanan Maharaj was taken to Akkalkot to facilitate his academic education. Shree Gajanan Maharaj was installed as the Head of Balappa Math by Sadguru Gangadhar Maharaj on 11th March 1938. Gajanan Maharaj was installed as head of the Balappa Math in the year 1938 when He was twenty years old. Before the installation, He had received personal Mantra from a high Entity. This High Entity was Lord Parashuram, His spiritual Guru. Shree Gajanan Maharaj left the body on December 6th 1987. His cremation was done at Shivpuri. Shree Gajanan Maharaj had already given written instructions several years before as to where His ashes should be immersed, after cremation. The ashes of Sharada Mata, who left the body within a few days of Shree Gajanan Maharaj, were also to be immersed. The wife of Shree Gajanan Maharaj, Sharada Mata was called Vahini by the people, an endearing title of love. Many experienced her kindness and motherly love whether whenever they visited Balappa Math. She was a great soul come down to Earth to share the work of Shree Gajanan Maharaj. For many year, Shree Gajanan Maharaj’s son, Dr. Shreekant Rajimwale, spread the message of Agnihotra through his Institute for Studies in Vedic Sciences at Shivpuri. Dr. Shreekantji established a genuine Rasashala to make Ayurvedic preparations for the public. His son, Dr. Rajabhau Rajimwale continues this humanitarian work through Vishwa Foundation. Shivapuri was founded by Parama Sadguru Shree Gajanan Maharaj who reiterated the Eternal Vedic message in the form of Fivefold Path. Shivapuri is distinguished by a massive Yajnya Pillar which was erected as a symbol of the unparalleled Vedic Somayag of 1969, announcing the ringing in of the New Era of super-science, knowledge and universal brotherhood. 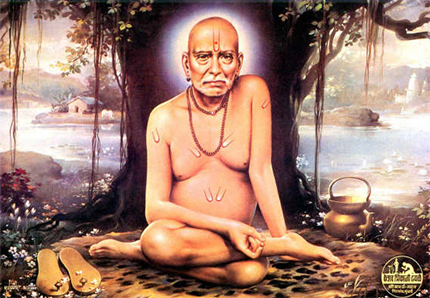 Shivapuri was named after Shivanand Yogindra Maharaj, the father of Parama Sadguru Shree Gajanan Maharaj. Shivanand Maharaj was the highest among Yogis. Some devotees believe that he is still in the state of Samadhi in Shivapuri in the cellar called Shivagumpha where the holy body was preserved before the place was sealed with stone. Shree once said, “Shivapuri in future will be the most Holy place of pilgrimage for innumerable followers of Fivefold Path spread all over the world. They will come to pay their respects to this holy land from where their beloved Master reiterated the eternal and universal message of Vedas. Shivapuri will henceforth be associated with our name like Bodh Gaya is with Lord Buddha, Mathura with Lord Krishna, Jerusalem with Lord Jesus Christ and Mecca with Prophet Mohammed. Purity and sanctity of this place will remain charged for thousands of year to come. The land on which an Avatar walks remains energised and holy for thousands of years”.